GQ Magazine has named former NFL quarterback Colin Kaepernick as its "citizen of the year." The GQ cover features Kaepernick, and says in the top right corner, "Men of the Year: The New American Heroes." "In 2013, Colin Kaepernick was on the cover of this magazine because he was one of the best football players in the world," GQ said. "In 2017, Colin Kaepernick is on GQ‘s cover once again—but this time it is because he isn't playing football. And it's not because he's hurt, or because he's broken any rules, or because he's not good enough. 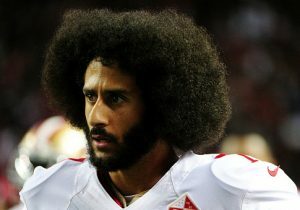 Approximately 90 men are currently employed as quarterbacks in the NFL, as either starters or reserves, and Colin Kaepernick is better—indisputably, undeniably, flat-out better—than at least 70 of them." Kaepernick has stated he began protesting in response to "systemic racism" and policing in the United States. "He is still, to this day, one of the most gifted quarterbacks on earth. And yet he has been locked out of the game he loves—blackballed—because of one simple gesture: He knelt during the playing of our national anthem," the magazine continues. Linda Sarsour, the Muslim co-organizer of the Women's March who has been accused of having "ties" to the Palestinian militant Islamist group Hamas and of romanticizing Sharia law, is cited by GQ for her views on Kaepernick. "You are an American hero. You may not feel like a hero right now, but one day, people will realize the sacrifices that you made for so many others," Sarsour said, directed at Kaepernick. "There might even be a day when we'll be walking down Colin Kaepernick Boulevard and people will remember what Colin Kaepernick did, just like we remember Muhammad Ali. And I truly believe that in my heart," she added.